Last week we saw the latest stop on the European Tour in Mauritius as players embark on the new season, seeking to gain any early-season advantage they can on the Race to Dubai. One of the challenges of the wrap-around season is it gives little (if any) time for a players off-season and an opportunity to review the previous season before jumping back into another packed schedule. Some might argue there’s no need to pause and reflect, a few schedule tweaks, some minor work with swing and putting coaches. This is in stark contrast to most sports which enjoy the luxury of the chance to pause for breath. Given the tiny margins between winning and losing, making or missing the cut, gaining entry to the majors or not, we absolutely recommend that players take the time to review and plan for the season ahead. We work closely with players to create performance plans, delivering intervention strategies grounded in objective data and hard facts. We illuminate blind spots and optimise the time spent working with their support team, delivering a framework for continuous improvement. 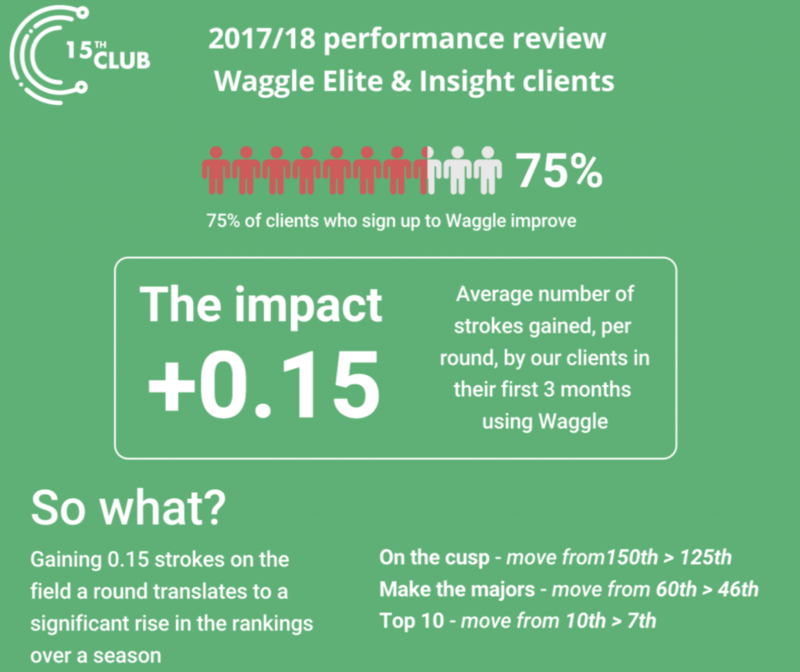 Taking a look at the numbers from our Waggle Elite and Insights customers’ 2018 season, the impact of the strokes gained number stands out. Last season they were on average +0.15 shots better than the field per round in their first three months using waggle. What is strokes gained? Simply put it reflects the quality of each shot the player takes. In aggregate it is the average number of shots a player is better than the field. A 0.15 improvement? So what? Broken down into rankings improvement over a season, a player gaining +0.15 shots each round over the field, translates to a significant jump in both world ranking and earnings potential. To add some weight to this, a player ranked 60th would jump to 46th by virtue of the improvement. More importantly, that jump is the golden ticket to the next years majors and WGC events. Our clients receive continuous access to their performance data via our proprietary software platform, Waggle. The ability to access trusted data to highlight weaknesses and validate their strengths provides very actionable insights. Defining practice interventions is a very simple yet incredibly valuable exercise. We have witnessed one of the games top ball-strikers, who only hits wedges during approach play on average three shots a round, spend 60% of the time practising an element of their game which contributes on average to 4% of their performance profile. Unless players choose to forfeit the events, financial upside, world ranking and Race to Dubai points, committing to the end of season review presents a unique challenge. Leveraging our analytics platform we can reveal the truth about performance and deliver a more intelligent approach to scheduling, course and practice strategy. Outthinking the field is the first step to outperforming them, that’s our sweet spot!